travel › Buy Poster of Traveler girl walking on railway tracks. Lonely traveler girl. Traveler. Traveler girl walking in sunshine. Travel concept. Backpack traveler. 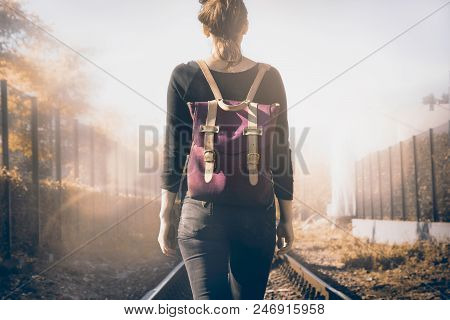 Poster of Traveler girl walking on railway tracks. Lonely traveler girl. Traveler. Traveler girl walking in sunshine. Travel concept. Backpack traveler.